Rhinoplasty is one of the most popular cosmetic surgeries that people undergo today. Whether you are looking to improve the appearance of your nose or you are looking to undergo functional rhinoplasty in order to correct breathing or sinus problems, rhinoplasty can restore balance to your face and improve your health. Rhinoplasty commonly results in increased self-esteem and more confidence. This can go on to profoundly change your life, giving you the ability to do the things you’ve always wanted to do. The good news is that rhinoplasty is a straightforward procedure. In fact, you can resume normal life in as little as a week. If you are considering undergoing rhinoplasty, you may have many questions, including what type of anesthesia is best. When it comes to anesthesia, most surgeons will provide you with two options: twilight sedation (also called intravenous sedation) or general anesthesia. Twilight sedation means that medication is delivered through an IV and the patient breathes on their own. It is less invasive because the individual is responsible for their own breathing. In contrast, general anesthesia involves the insertion of a breathing tube once the patient has fallen asleep. The anesthetist controls breathing. Some use this method as a means to prevent blood and mucus from entering the airway. What Type Of Anaesthesia Is Preferred For A Rhinoplasty Procedure? While excellent results occur under both methods if delivered by an experienced anesthesiologist, the majority of plastic surgeons have a preference for twilight sedation (of course, this isn’t always the case). Some types of rhinoplasty are typically performed under general anesthesia due to the nature of the procedure. There are several reasons why many plastic surgeons lean toward twilight sedation. First of all, many perceive it to be safer and there are no risks associated with the use of the tube. Some surgeons, however, believe that general anesthesia is safer. Regardless, most surgeons will agree that twilight anesthesia results in less bleeding as well as nausea after the procedure. In short, recovery is easier when twilight anesthesia is used. The lack of vomiting means that the patient typically experiences less bruising and swelling as a result. 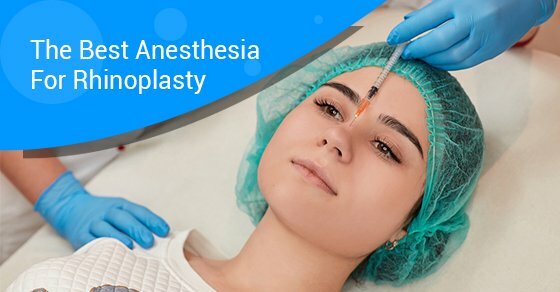 What type of anesthesia you decide on will depend on the type of rhinoplasty you are undergoing, as well as what you and your plastic surgeon/anesthesiologist are comfortable with. Regardless of what method you choose, know that there are benefits to both. If you are interested in undergoing functional rhinoplasty, consider Dr. Oakley Smith. He is one of the best plastic surgeons in the country and the only one in Ontario that concentrates exclusively in the area of rhinoplasty. Contact his clinic today for a consultation.